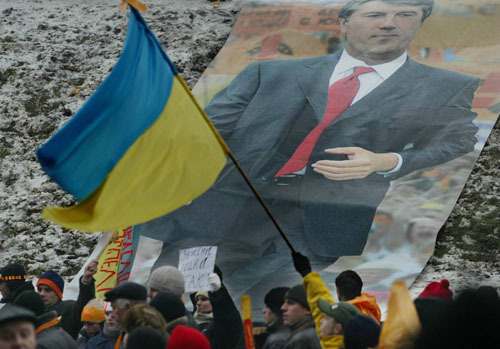 Supporters of opposition leader Viktor Yushchenko pass by his portrait during a rally near the Ukrainian parliament in Kiev, Saturday, Nov. 27, 2004. Ukraine's parliament on Saturday declared invalid the disputed presidential election that triggered a week of growing street protests and legal maneuvers, a move that is not legally binding but clearly demonstrated rising dissatisfaction with the announced outcome. Flag is Ukrainian national flag.